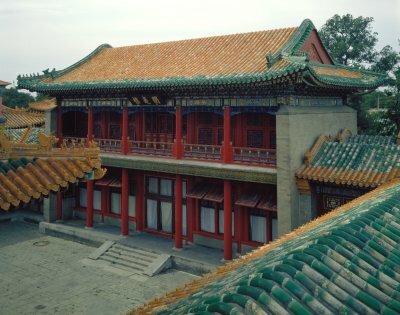 Construction finished in 1776, the forty-first year of the Qianlong reign (1736-1795), the Hall for Viewing Opera (Yueshi lou) is located north of the Pavilion of Pleasant Sounds (Changyin ge), in the central section of the Palace of Tranquil Longevity (Ningshou gong) compound. In Qing dynasty (1644-1911), it was the place where traditional Chinese operas were performed. On special occasions such as the Spring Festival or the emperor's birthday, emperor, empress, imperial princes and court ministers would gather here in the two-storey hall to enjoy opera performances. Court ministers would sit in the winding corridors on the two flanks. Among Qing dynasty emperors and empresses, the Qianlong Emperor and Empress Dowager Cixi had a special indulgence in spectating operas.